It’s the buzz among baby boomers and it’s another slam dunk for Netflix. If you’re a subscriber, or piggyback off someone else’s account, you know that series such as Orange is the New Black, Bloodline, Breaking Bad, House of Cards and now, Grace and Frankie, is taking center stage. Jane Fonda (Grace) and Lilly Tomlin (Frankie) star as two women whose lives are suddenly turned upside down when their husbands reveal they are gay. Where Grace and Frankie thought they would grow old with their husbands, not each other, they must reevaluate their dreams and their understanding of themselves. The two women don’t actually get along, but are forced to air kiss and feign affection because Grace’s husband, Robert (Martin Sheen), and Frankie’s, Sol (Sam Waterston), are law partners and best friends. The women form an unlikely bond and take us on a journey of comedic introspection in an exposing excavation to face an uncertain future together. 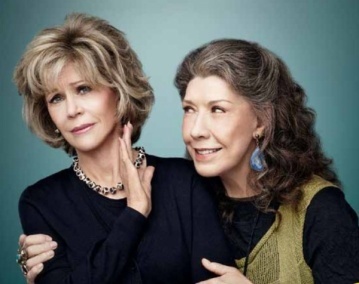 When the men announce that they are also longtime lovers, Grace and Frankie are at first disbelieving and stunned, especially about why their husbands waited so long to come out. Robert explains that they now want to marry because in California, at long last, they can. The women share indignation as well as panic, sorrow and anger. Grace complains that Robert and Sol get to live happily ever after and also hog the high road, since they are gay and not run-of-the-mill skirtchasers. Had they left their wives for younger women they would be viewed as heels; in Malibu, at least, they are heroes. Other topics that are addressed in the series include, substituting the Internet for social interaction, intimacy, friendship, unexpected changes, taking risks, going outside your comfort zone and adding levity to difficult situations. The comedy, wit and wisdom that Grace and Frankie convey are uplifting, inspiring and touch a core issue about aging honestly and gracefully. Grace and Frankie pave the way for thoughtful, well-written dialogue for the 50 set. Jane Fonda, 77 and Lily Tomlin, 75, become frenemies who learn to commiserate and navigate their new life as roommates and senior singles. The series premiered in May to rave reviews and has already been renewed for a second season. In a recent interview, Fonda says she suggests binge-watching the show, as all the episodes premiered at once to a total of six and a half hours. Fonda brings along some vulnerability to Grace, a vain, retired cosmetics executive, and Tomlin adds fun and sass to Frankie, a New Age artist. “Grace and Frankie” is directed toward one demographic. It comes along at a time when baby boomers are literally poised to step into their 70’s. The boomer years began in 1946, so for many born during those years, now is the time to reevaluate, recreate, redesign, and redefine the aging process. The rules have changed. The world has changed. It’s up to us to see the glass as half empty or half full. Grace and Frankie sometimes fill their glasses with some spirit that lifts their spirits but more often than not, they are addressing the confounded truth. It’s time to change our thinking and to let life move us “Grace”fully into the hopeful future that may not look the way we planned, yet offers a new hope when we are honest and “Frank” (ie) with how we look, feel, love and play. New Door KnobsStart the New Year NOWWise Guy/Wise Man Jim CarreyMe, My Wife & IreneCheating in Baseball? Say it ain’t so!